Dr. Gary May is the Chancellor of the University of California, Davis. He received his bachelor’s degree in electrical engineering from the Georgia Institute of Technology and was awarded his M.S. and Ph.D. degrees in electrical engineering and computer science from the University of California at Berkeley. Gary was a National Science Foundation and an AT&T Bell Laboratories graduate fellow, and he worked as a member of the technical staff at AT&T Bell Laboratories. He subsequently served as a faculty member in Electrical and computer Engineering at Georgia Tech, Executive Assistant to Georgia Tech President, and later the Steve W. Chaddick School Chair of the School of Electrical and Computer Engineering. Before coming to the University of California, Davis, Gary held the position of Dean of the Georgia Tech College of Engineering. 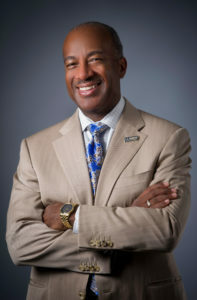 He has received numerous awards and honors throughout his career including the Presidential Award for Excellence in STEM Mentoring, Outstanding Alumni Award in Electrical Engineering from the University of California, Berkeley, the American Association for the Advancement of Science Mentor Award, the National Society of Black Engineers Golden Torch Award: Janice A. Lumpkin Educator of the Year, the Motorola Foundation Professorship at Georgia Tech, an honorary doctorate degree from the Latin University of Panama, and many others. Gary has also been named a Fellow of the American Association for the Advancement of Science and an IEEE Fellow. Gary has joined us today to talk about his experiences in life and science. When he’s not focusing on his own research, Gary helps facilitate and support the work of others at the University of California, Davis through his role as Chancellor. In his personal life, Gary enjoys spending time with his wife and two kids. His girls are both in college and are preparing to launch their own careers. As a researcher, Gary is an electrical engineer, and his work focuses on semiconductor manufacturing. Integrated circuits/computer chips are in a lot of the technology we interact with on a daily basis including our phones, cars, and TVs. He is working to make the manufacturing of these integrated circuits more reliable, repeatable, affordable, and efficient. As Chancellor, Gary leads about 37,000 students and 23,000 faculty and staff at one of the top public universities in the United States. He dedicates his time to fundraising, fostering the success of students and faculty, and working with university leaders, government officials, media, and other stakeholders. As a kid, Gary enjoyed reading science fiction and comic books. He was inspired by the amazing technologies and capabilities the authors described. Gary also enjoyed building things with Legos and Erector Sets, as well as solving puzzles. These early childhood interests drew him towards engineering. During high school, Gary participated in a mentorship program where he was paired with an engineer at a company, and he got to see firsthand what engineers do at work. Afterwards, Gary was excited to study electrical engineering as an undergraduate at Georgia Tech, one of the top engineering schools in the United States. Pursuing a career in electrical engineering as an African American male has been challenging because his demographic is underrepresented in this field. At each stage as a student, professor, and academic leader, it was difficult for Gary to not have colleagues who looked like him and who had similar experiences. He has made it a priority to encourage underrepresented minorities to pursue careers in science and engineering through programs he developed while on the faculty at Georgia Tech. In recognition of his great accomplishments with these programs, Gary was presented with the Presidential Award for Excellence in STEM Mentoring by President Obama in 2015. Gary has had many excellent PhD students, but one student had a particularly compelling story. This African American male student was placed in the special education track in his early school years, but his mother was determined to get him back into the standard education track. They worked hard and were eventually successful. The student went on to get a PhD in electrical engineering from Georgia Tech with Gary as his advisor. This was an inspiring story that makes Gary wonder how many students like this one our current education system is missing with its limited offerings for different learning styles. Picking one favorite destination is difficult for Gary because his work has taken him around the world to China, Australia, West Africa, South Africa, and different parts of Europe. When he was at Georgia Tech, he visited their Georgia Tech, Lorraine campus located in the northeast Lorraine region of France in the city of Metz. His current position also involves a lot of travel to meet with people, and this is an exciting part of the career. Gary is looking forward to observing wildlife on an upcoming trip to the Serengeti in East Africa. He likes to humanize what he does, so he is active on social media. Gary enjoys sharing what he is doing professionally as Chancellor, but he also enjoys talking about his own personal interests as well. He listens to a lot of old 1970s rhythm and blues music and sometimes shares snippets from his playlist on social media. It’s important to remember not to lose your sense of self or your interests when you become a scientist, an engineer, or a leader. You shouldn’t feel like you have to change yourself to be successful. Work hard, play hard, and pray hard. You have to work hard to be successful, but you should also be well-rounded and not take yourself too seriously. Having a spiritual side may help you stay focused and balanced. Find what you love to do, and pursue it. If you are doing something you love, then you never work a day in your life. As chancellor, Gary leads UC Davis as it advances its mission in several key areas, including: achieving equal access to education and opportunity for students of all backgrounds; building diversity and nurturing success among students, faculty and staff; deepening the university’s engagement with Sacramento, Davis and the surrounding region; and conducting useful research and outstanding scholarship in areas of critical need to California, the nation and the world. An accomplished scholar and engineer, Gary came to UC Davis from the Georgia Institute of Technology in Atlanta, where he had been for nearly three decades. Gary is known as a dynamic leader with a passion for helping others succeed. He believes success is best judged by “the extent you enhance the lives of others.” Throughout his career, he has championed diversity in both higher education and the workplace. He developed and led programs to attract, mentor and retain underrepresented women and ethnic minorities in STEM — the fields of science, technology, engineering and math. In 2015, President Obama honored him with the Presidential Award for Excellence in STEM Mentoring. Gary has won numerous research awards for his work in computer-aided manufacturing of integrated circuits and other devices. He has authored more than 200 technical publications, contributed to 15 books, and holds a patent in this topic. A native of St. Louis, May is married to LeShelle R. May, a software engineer, and they have two daughters, Simone and Jordan, who are in college.